Introduced to the New England automotive press, the midsize crossover finds favor with the Ellsworth American reviewer. 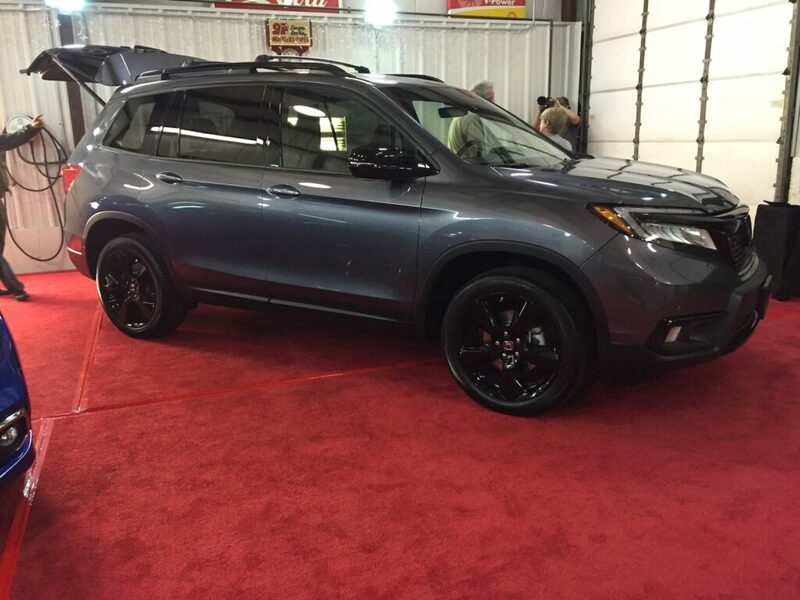 The new Honda Passport receives attention at a meet-the-press event in Middleboro, Mass., last week. Photo by Tim Plouff. MIDDLEBORO, MASS. – The media coverage may be all things electric-powered or autonomously operating, but the sales charts and industry dialogue are all about crossovers and how they are dominating sales, production, and consumer’s preferences. Honda is extending its reach into this category with a new two-row, midsize crossover that resurrects a name from one of the brand’s earliest SUV offerings – the Passport. 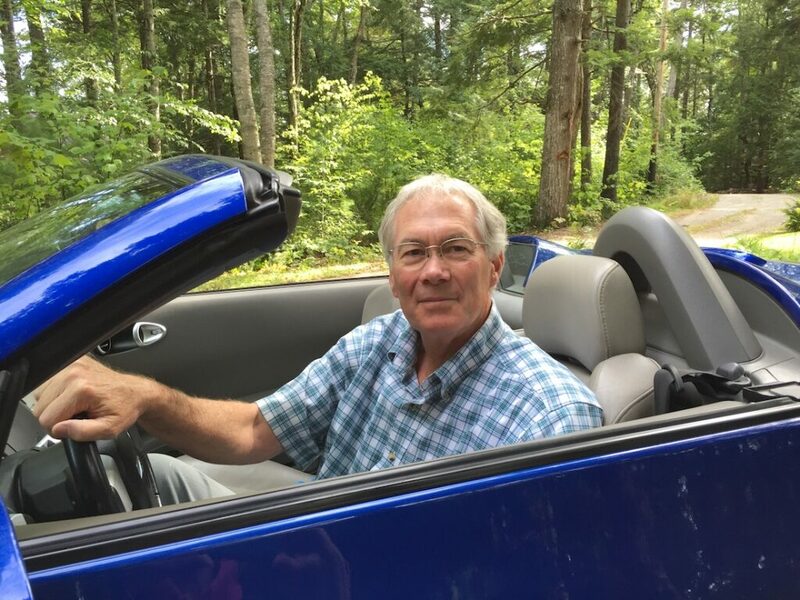 Tim Plouff has been reviewing automobiles for the Ellsworth American for more than 25 years. Essentially a Honda Pilot that was left in the dryer too long, the seven-inch-shorter Passport uses the same chassis, powertrain and front interior as the three-row Pilot. Buyers will gain a revised I-VTM4 all-wheel-drive system with three drive modes for off-road use; a much larger rear cargo area (that includes a ‘basement’ space for wet or dirty gear); and all Passport models – Sport, EX-L, Touring, Elite – ride on 20-inch wheels on a fully independent suspension that offers one inch more ground clearance than the Pilot. Add some black-out trim, distinct fascia panels, and variations of the 20-inch wheels, and voila – a new crossover. Using the brand’s 280-hp 3.5-liter V-6, plus Honda’s new nine-speed automatic transmission (with the same vexing console push-button shifter actions) the Passport is quick. EPA estimates range from 19/25/22 mpg depending upon trim or FWD or AWD status. Properly equipped models can tow as much as 5,000 pounds. Honda’s extensive Sensing Suite of safety and electronic driving aids – braking assist, on-road mitigation assist, forward collision warning, lane departure warning, adaptive cruise, auto high-beams – is standard across the lineup, as are Apple/Android functionality, eight-inch touchscreen, Wi-Fi connectivity, and wireless phone charging. Honda claims best-in-class interior space, with a humongous rear cargo hold where the Pilot’s rear seats might have been. Competition includes Chevy’s new Blazer, Ford’s Edge, the latest Hyundai Santa Fe, Nissan’s Murano, and the elephant in the room – the top-selling Jeep Grand Cherokee. Pricing for the Passport starts at $31,990 for a front-drive Sport. Add $1,900 for AWD and $1,045 for destination fee. Top Elite trim rings in at $44,725, with sunroofs, heated leather, top-end audio system and all the bells. A quick drive revealed responsive, dependable Honda operating traits, plus a spacious cabin. Honda has restored a volume knob to the touchscreen but still lacks a station tuning selector as the market has requested. Excellent packaging creates countless storage pockets. Along with the new Passport, Honda brought two copies of the Civic, which has been freshened for 2019. Honda is determined to continue building the cars that America wants – the Civic and the Accord – although Chrysler, GM and Ford have essentially abandoned the segment. Also on the evening’s agenda was an insightful presentation by Michelle Krebs of Cox Automotive, an industry research and content development firm that monitors trends and conducts focus studies for various automakers. Krebs’s wide-ranging talk covered the rapid ascent of crossovers and how cars have been kicked to the curb as buyers expectations have shifted. From uber-luxury class customers at Bentley, Rolls-Royce and Lamborghini to Chevy, Honda, and Ford drivers, crossovers are king right now. And the automakers are not unhappy about building these hyper-profitable products, either, since they face mandated efforts to soon build thousands of EV’s that remain minuscule selling products, especially in markets after any tax incentives are removed or exhausted. When asked what will be next – with American families (and others) moving from sedans to station wagons to minivans to SUV’s to crossovers – Krebs was hesitant to commit. One writer speculated that perhaps today’s crossovers are becoming (or will become) more City Utility Vehicles, (lighter, smaller, more nimble for tight spaces); while SUV’s are fast becoming Suburban Utility Vehicles (more tow-ready, more rugged for off-roading and different seasonal driving needs). A hint of the trend is occurring in some of the latest luxury-class compact crossovers from Lexus, Volvo, and other automakers. In our current crop of crossovers, it should not be forgotten that Toyota and Honda led the shift from five-door hatchbacks to compact crossovers with the first RAV4 and CR-V just over 20 years ago. Less than 10 years ago, Porsche, the venerable German sports car maker with rich margins and a committed, loyal customer base, introduced its first crossover/SUV, the mid-size Cayenne. Despite howls of protest, Porsche is now a stronger, more viable automaker. There will soon be four SUVs in the Porsche lineup. In a wide-ranging discussion with New England’s automobile media, not one mention was made of electric vehicles superseding crossovers. Zero. There remains great skepticism about any wave of EVs sweeping the market, at least at current pricing levels, and with a general lack of re-charging networks to serve any rapidly expanding EV fleet. Passport and Civic: two winners from Honda, as the brand continues to forge its own path forward. Honda loyalists will embrace the latest offerings.